Content marketing strategy deals specifically with content marketing. Content marketing strategists determine what content will build the customer base by helping people make decisions or solve problems at various points in their experience with the brand. Given that content marketing strategy is a sub-discipline of content strategy, does that mean the folks in marketing report to a content strategist? Not usually. In most organizations, the content strategist and content marketing team report up through different departments, even if they sit next to each other on the same project team. Content marketers typically report to the marketing team, while content strategists report to the UX team. I show my students the hive diagram that Kristina Halvorson has used in her presentations. This diagram details a range of possible roles on a web team. Of course, not all content is web content, but the diagram (with a few tweaks) would look similar for any kind of content team. 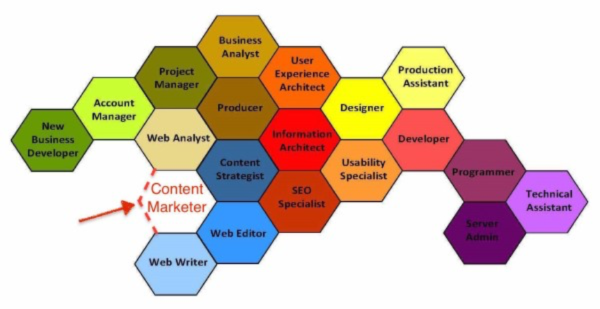 The original hive diagram doesn’t include the content marketer role. In my class, I point to where I think the content marketer might belong: nestled in among the web analyst, content strategist, web editor, and web writer roles. My version of the hive diagram created by skillset.org. The original (not including “content marketer”) formerly appeared on the Brain Traffic blog. Here’s how I see the content marketer role in relation to each of its neighboring roles. Keep in mind that a role doesn’t necessarily belong to a person. Sometimes, multiple people play a role. Other times one person plays multiple roles. 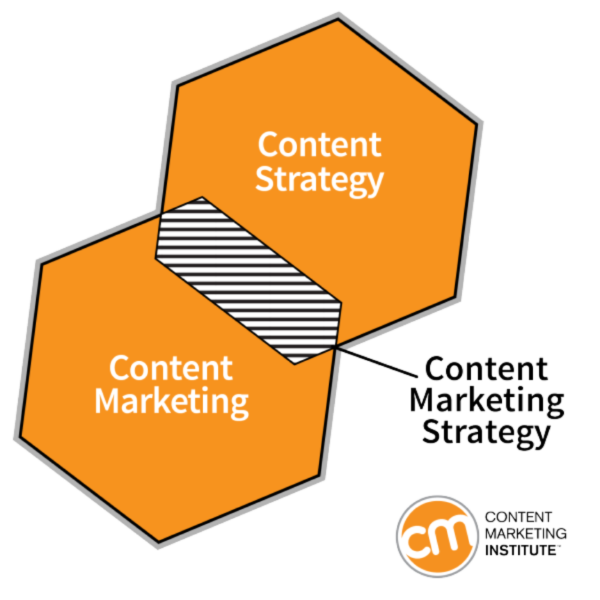 Of course, the content marketer works with other roles, too, not just with the adjacent hexagons in this two-dimensional representation. Zoom in to see more accurately the relationship I’m focusing on in this article, namely, the relationship between content marketing and content strategy. This view reinforces my point about content marketing strategy being a sub-discipline of content strategy. Content strategists do some things that content marketers don’t, and vice versa. The area where the two functions overlap – where people are thinking strategically about content marketing – is content marketing strategy. It doesn’t matter who’s doing that work in the middle; it could be a strategist doing content marketing work or a content marketer doing strategy work. What matters is that someone’s doing this work. With traditional marketing becoming “less and less effective by the minute,” this overlap area – content marketing strategy – may represent one of your organization’s biggest growth opportunities today. In summary, when we use “content strategy,” “content marketing,” and “content marketing strategy” interchangeably, we confuse people, from new practitioners looking to enter the field to organizations trying to make sound hiring decisions. A content strategist plans and guides content efforts across the organization, including marketing efforts. 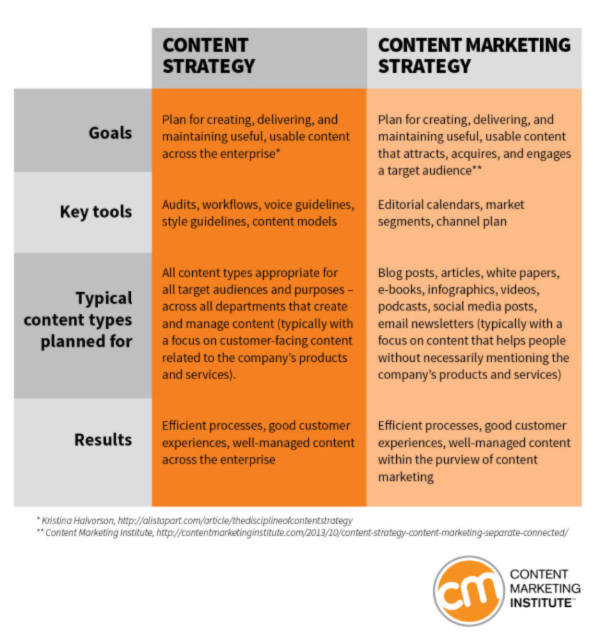 A content marketing strategist plans and guides content marketing efforts specifically. A content marketer may play a strategic role, a tactical role, or some combination of the two within the practice of content marketing. If I’m being honest, I don’t see the confusion clearing up anytime soon. I expect to keep seeing content marketing roles with the title of “content strategist.” But it’ll be OK. We’ll keep working together. We’ll support each other. 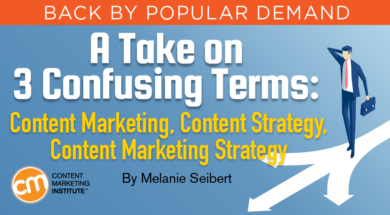 And we’ll keep explaining the distinctions between these three terms – content marketing, content strategy, and content marketing strategy – to anyone who’s interested. We’ll make the content world a less confusing place one conversation at a time. Want to expand your content marketing strategy skills? Register today to attend Intelligent Content Conference March 20-22 in Las Vegas.